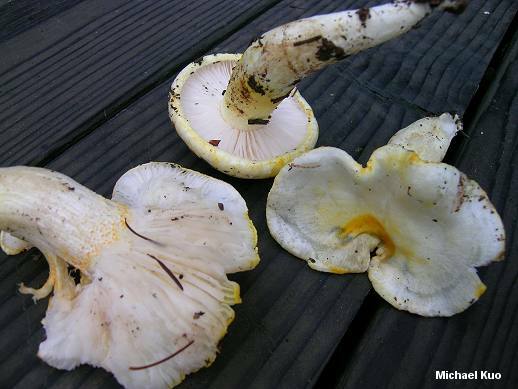 When fresh, Hygrophorus chrysodon is a gorgeous white waxy cap delicately decorated with yellow flakes on the cap margin and the stem apex. With age, however, the yellow ornamentation can fade--or, the cap can become more or less yellow overall. 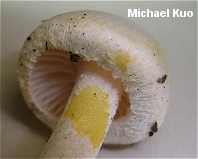 Applying a drop of KOH to the mushroom's surfaces produces a bright yellow reaction, and this is one of the best ways to identify the species when it is not being picturesque. 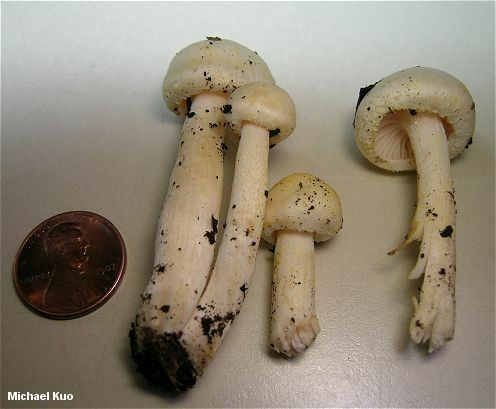 Ecology: Mycorrhizal with conifers (and rarely reported with hardwoods on the West Coast); growing alone, scattered, or gregariously; summer and fall (over winter in warmer climates); widely distributed in North America. The illustrated and described collections are from Colorado and California. 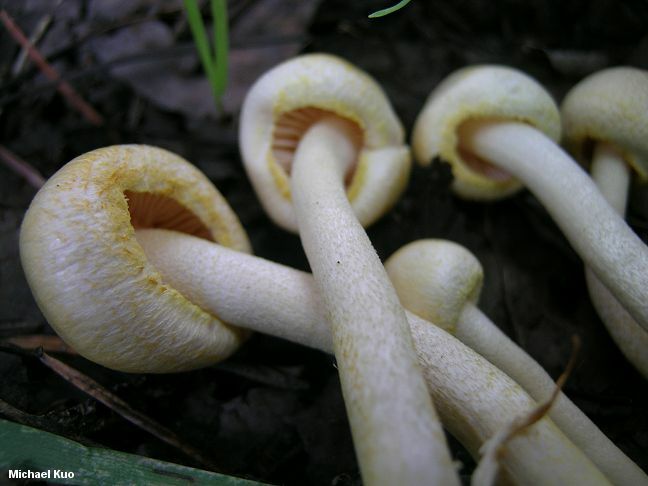 Cap: 1.5-6 cm; convex when young, becoming broadly convex, broadly bell-shaped, or more or less flat; slimy when fresh; white when young and fresh, overlaid with yellow to golden or orange-yellow granules along the margin; becoming yellow overall with age; the margin at first inrolled. 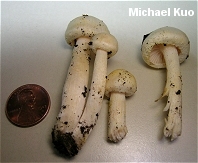 Gills: Broadly attached to the stem or beginning to run down it; close or nearly distant; white; short-gills frequent. Stem: 3-10 cm long; 3-12 mm thick; equal above, but tapering to base; when fresh sheathed with slime, at least over the lower portion; the apex dotted with granules like those on the cap margin, sometimes aggregated into an imperfect ring zone; whitish overall. Odor and Taste: Odor not distinctive, or somewhat unpleasant; taste not distinctive. Chemical Reactions: KOH bright yellow on stem, cap surface, or flesh. Microscopic Features: Spores 7-10 x 3.5-4.5 µ; smooth; long-ellipsoid; hyaline in KOH; inamyloid. Basidia 4-sterigmate; 45-55 µ long. Hymenial cystidia absent. Lamellar trama divergent. Pileipellis an ixocutis. REFERENCES: (Batsch, 1789) Fries, 1838. (Fries, 1821; Saccardo, 1887; Kauffman, 1918; Hesler & Smith, 1963; Bird & Grund, 1979; Largent, 1985; Arora, 1986; States, 1990; Phillips, 1991/2005; Lincoff, 1992; Evenson, 1997; Barron, 1999; Roody, 2003; McNeil, 2006; Miller & Miller, 2006; Trudell & Ammirati, 2009; Lodge et al., 2013.) Herb. Kuo 08160716, 08071003. Herb. DBG RMNP 2008-050, 2008-084.